February 1, 1781 — On the current site of Cowans Ford Dam, Militia General William Lee Davidson is killed in a Revolutionary War battle. 1901 — Associates of James B. Duke began purchasing Catawba river valley bottom land to prepare for creation of a lake for hydroelectric power generation. June 22 , 1905 — Southern Power incorporates in the state of New Jersey. 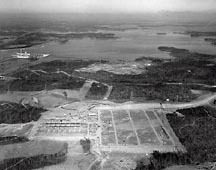 1906 — Southern Power Company (predecessor of Duke Power Company) begins purchasing lands for the Cowans Ford/Lake Norman development. At this early date, Southern Power refers to what would later become Cowans Ford/Lake Norman as “Mountain Island Development No. 2” (No. 1 being today’s Mountain Island Hydro Station). Southern Power continues acquiring land for Cowans Ford/Lake Norman until the late 1950s. J. B. Duke begins acquiring lands for the South Carolina generating stations as early as 1899, but not until 1906 for the Cowans Ford Development. September 28, 1959 — Construction starts on Cowans Ford Dam. Hundreds of people turn out for a groundbreaking ceremony. The dam is dedicated five years later on September 29, 1964. The dam blocking the Catawba River is what forms Lake Norman. Artist’s rendering of Cowans Ford Dam prior to construction. North Carolina’s Governor Hodges at the groundbreaking of Cowans Ford Dam. The Catawba River during the construction of Cownas Ford Dam. October 27, 1953 — Norman A. Cocke Sr. is elected fifth president of Duke Power. Lake Norman will later be named after him. October 4, 1956 — Duke Power shows interest in building a nuclear reactor around Charlotte. May 15, 1957 — Duke Power announces it’s plans for the construction of Cowans Ford Hydro Station. January 29, 1962 — Duke Power Board of Directors approves the donation of 1,328 acres of land to the state of North Carolina for what will become Duke Power State Park. August 15, 1962 — Duke Power announces publicly it’s intention to donate land near Troutman to the State of North Carolina. 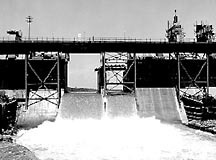 February 1963 — Cowans Ford Dam fills, Lake Norman is complete. Water pours through the spillway at Cowans Ford Dam. 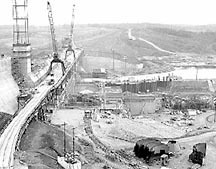 Cowans Ford Dam under construction. 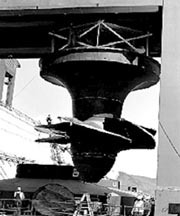 The first of four turbines being lowered into place. Cowans Ford Dam is complete. September 30, 1963 — Commercial operation begins at Cowans Ford Hydro Station Units 1-3. September 29, 1964 — Cowans Ford Dam is officially dedicated. (This date marks the end of Lake Norman’s construction.) Governor Terry Sanford announces that Duke Power might construct a nuclear station on Lake Norman. June 4, 1965 — Duke Power State Park officially opens to the public. November 17, 1969 — Plans for the McGuire Nuclear Station are announced. The station is to be named after William Bulgin McGuire, president of Duke Power from 1959 to 1971. 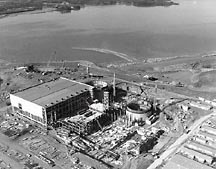 February 24, 1970 — Duke Power officially announces it’s formal intent to construct the McGuire Nuclear Station on Lake Norman. The chosen site is announced to the public. 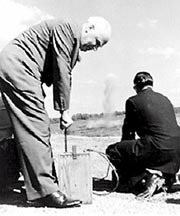 April 1, 1971 — A groundbreaking ceremony is held at the future site of McGuire Nuclear Station. September 12, 1981 — McGuire Unit 1 puts out its first kilowatt-hours of electricity. Unit 1 will begin commercial operation Dec. 1 of that same year. Unit 2 will start producing electricity in 1984. June 23, 1993 — The Lake Norman Times hits newsstands for the very first time. Construction of McGuire Nuclear Station begins. McGuire Nuclear Station is well underway. Timeline facts reprinted with permission of the Lake Norman Times and Duke Energy. Timeline updated March 2003. All photos used with full permissison of Duke Energy. Photographs in this section are copyright © Duke Energy and may not be reproduced without prior permission of Duke Energy.